Magnolia 'Heaven Scent' has large goblet or tulip shaped flowers in April-May that are a pale pink decorated with a darker stripe on the outside and fade to white inside. The flowers are around 10cm in length and highly fragrant, with their soft colouring contrasting wonderfully with the dark green foliage on this lovely Magnolia tree. With an upright habit when young, Magnolia 'Heaven Scent' spreads gently as it matures and will grow to just 6 x 4 metres in 20 years, making it ideal for a small garden. 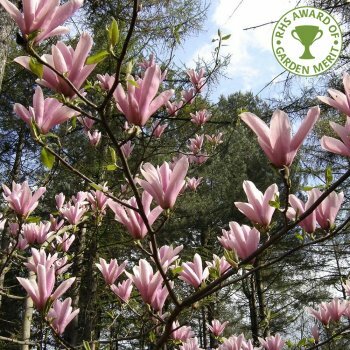 Plant in well-drained soil, in a sheltered position in full sun or partial shade and this Pink Magnolia tree will reward you with beautiful fragrant blooms and lush foliage. Our pot grown Pink Magnolia 'Heaven Scent' can be planted at any time of the year. Firstly, remove all weeds and grass within a metre of your desired planting hole. Dig a square hole as deep as your root mass and approximately 2x as wide. To help your Magnolia establish more effectively, sprinkle root grow in the hole. For tree forms of Magnolia Heaven Scent, we recommend using a stake and tie kit and rabbit guard when planting, but these are not needed for the bush forms. The help and advice section has further information and videos. Pink Magnolia 'Heaven Scent' trees can be pruned into shape, but should not be heavily pruned as they can go into shock. Simply remove any damaged branches or any that are growing in an awkward position. If pruning to limit the overall size, stagger your pruning over a few years to alleviate the stress on your tree. Pruning for Pink Tulip Magnolia should be carried out in mid-summer to early autumn. Avoid pruning in late winter to early spring.